Discussion in 'Shopping, Deals, Discounts & Bargains' started by Lex, Apr 14, 2004. Mine Arrived this morning (ordered last week) and I didn't even get caught by customs! I have seen these going for £100 on ebay! Yea I ordered one of these last month from Playusa.com for £44.99. It only took a few days to turn up and I did not get stung by customs. Much better in every way to the UK version (package quality, extra stuff, brill easter egg that's missing from R2). The wee cards are cool and the fan club mini mag and extra disc is a nice extra as well. If they sell out from Amazon though Playusa are still selling them for the £44.99. I bought the R1 from there but I did get done by customs for about £11 . I think the R1 version can be had at a few places - I got mine from DVDPacific as well with no customs. sorry to show my ignorance here, but is htis box set all three films??? It's actually The Fellowship Of The Ring in its extended form and it's a collector's edition which includes 2 bookend "statues"
They are both gorgeous sets and I would recommend a purchase. 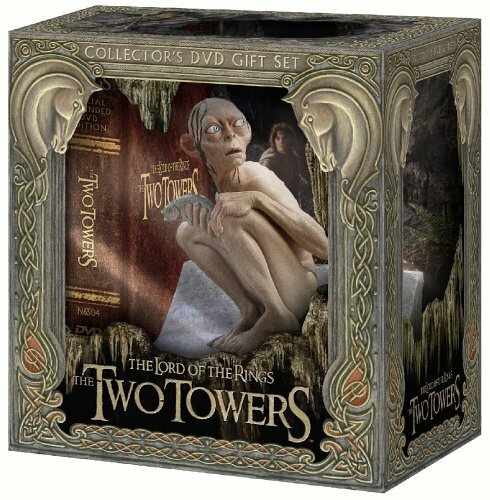 I am about to order LOTR (Fellowship of the ring) Extended edition & (Two Towers) Extended edition from CD-WOW.. Has anyone every been hit by customs on these two items from CDWOW??????????????????? Yea mine too, forgot about that disc as I've yet to watch it.